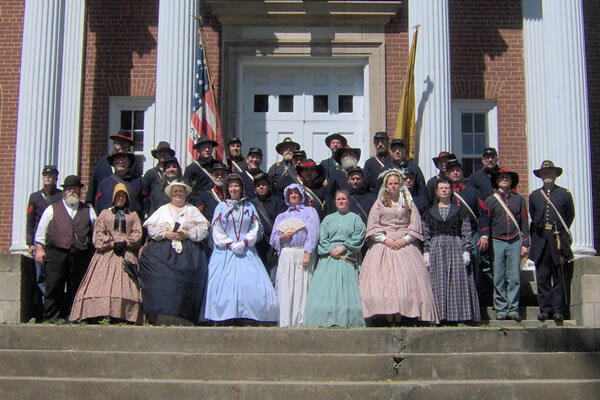 ￼Battery G is a Civil War reenactment group, based in the Rockford, IL area, that participates in battle reenactments, living history encampments, parades, ceremonies and educational presentations. We are a state chartered non-profit organization whose mission is to educate the public about the American Civil War, about the role that field artillery played in the war and about the people who fought and lived through those difficult times. In order to properly educate￼ the public, we strive for authenticity in our impressions, uniforms, equipment and encampments. Click on Photo Gallery to see pictures of us at some of our events. 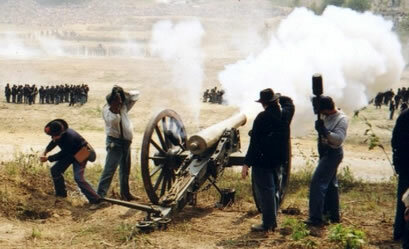 The photo of the gun firing was taken at the 1999 national re-enactment of the Battle of Chickamauga. In the background, the lines that you see are Confederate infantry and behind them, what appear to be trees, are thousands of spectators. We currently have 5 cannons in our arsenal; 3 of which are original barrels used during the Civil War while the other 2 are full scale reproductions. In addition to our cannons, we have a traveling forge, one of two known reproduction forges in the nation used by reenactors. If you’re interested in having the Battery or it’s members at an event or function, please get in touch with Captain Patrick DeGeorge, our club President and unit commander. To see us at one of our events, see our current year schedule . ￼ We have around 60 active members, soldiers and civilians, individuals and families in our club; all of whom share a common interest in history and the Civil War in particular. Our members come from northern Illinois (including the Chicago area), eastern Iowa and southern Wisconsin. Shown here, is a group of us at a Mt. Carroll Living History. Battery G is always looking for new members who would like to participate with us in this great hobby. Dues are modest and are used to maintain our equipment as well as to help pay for our other expenses. If you’d like to join Battery G or want some more information about us or reenacting in general please get in touch with our recruiter. from DeKalb County and 25% were from Ogle County. The flag that you see is a Battery G guidon, courtesy of John Schmale, taken from his Civil War Flags of Illinois site. Battery G, 2nd Illinois, Light Artillery was mustered into Federal service on December 31st, 1861. Throughout the war the Battery was assigned to the western theater of operations and participated in the Vicksburg campaign, fought at the battle of Nashville and was enagaged in numerous skirmishes and engagements in Alabama, Mississippi, Missouri and Tennessee fighting against, among others, the Confederate troops of Nathan Bedford Forrest and Sterling Price. One Battery member, Corporal Sam Churchill, received the Medal of Honor for gallant action at the battle of Nashville. At the end of the war the Battery was stationed in Montgomery Alabama, where it was mustered out of Federal service on September 4, 1865.